I have a problem with craft punches. And my problem is that I love them. I go to Michael's, and they call to me and my 40-percent-off coupons. But I'm not a scrapbooker. I've made half-hearted attempts, but it's not me. Too much planning, too much detail, too much paper to fiddle with and store. So what to do with all those craft punches that keep coming home with me? I made it with pretty craft paper, my Martha Stewart sheep punch, and some foam craft dots. The "how" is pretty simple. I punched out white sheep (and one black one, just to mix things up), and arranged them in a pattern on my green paper. 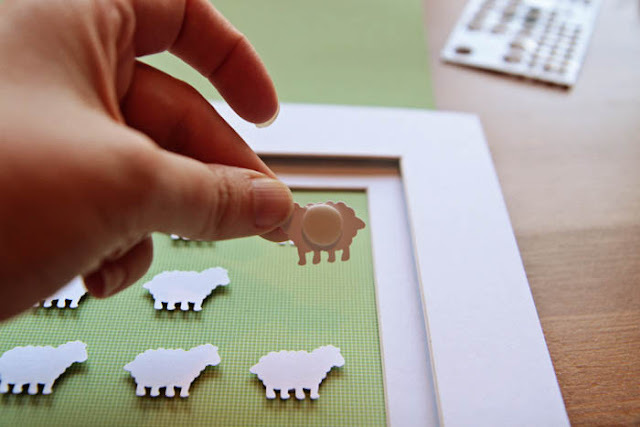 By sticking a foam dot behind each sheep, I got them to float off the background a bit. Below you can see the difference; the sheep in the column on the right aren't mounted on their foam dots yet. 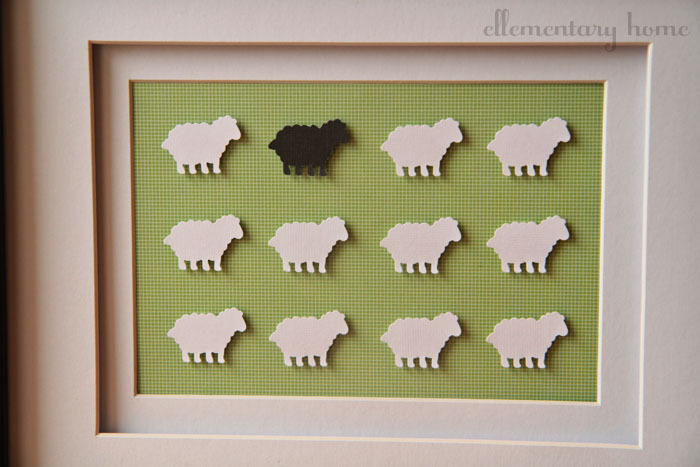 Because I wanted to use a frame with glass, I needed a thick and/or layered mat to allow room for the floating sheep. Obviously, a traditional frame and mat would just smush those pretty animals right up under the glass. 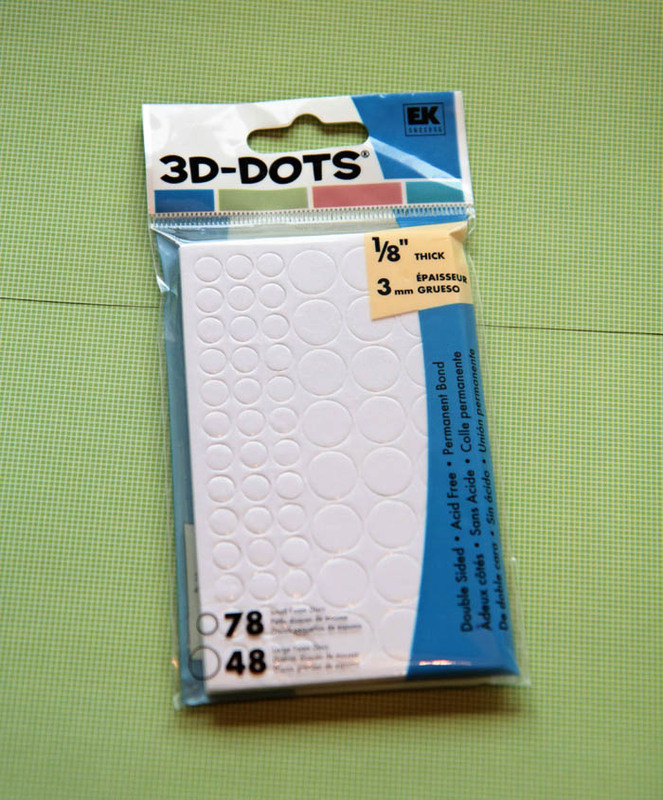 The one I used is from Michael's, and it's perfect. The sheep have plenty of room to breathe even with the glass on top. I'm hanging it over my kitchen sink for a nice reminder of spring as I'm doing the dishes. And a bonus is that I can remove the sheep and substitute something else when the season changes. Lobsters for summer? Pumpkins for fall? Trust me, I have a whole box of punches to choose from. That is too stinkin' cute. I love how dimensional it is by floating the sheep. Perfect. That project is so cute ... and I'm really digging you blog's "voice." I'm going to check out some more posts. You know, stalk around a bit! 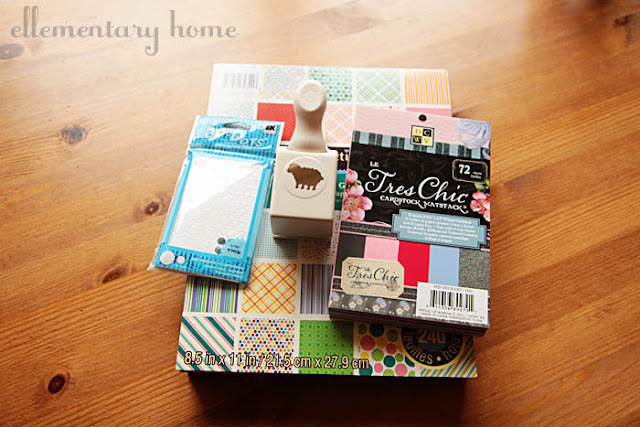 Just a reminder to link up at our "It's a Cinch" party today ... this project is perfect. Plus, there are 5 of us participating, so if you link at one you'll automatically be linked at all 5! Yay! You're at the party ... can I get you a glass of red or white? Thanks and have an awsome day! That is too freaking cute!! Love it!! I'm not a scrapbooker either- it always seems fun when I'm in the store looking at all the supplies, but I don't have the patience to spend 4 hours on one page, which is what my scrapbooking friends will do. So I've never picked up the hobby. I'd rather do cute, easy stuff like this! Adorable project! love it. it also plays on the "black sheep" idea as well. I love your sheep-following you from Kate's party-stop by for a visit! So cute. I remember the Princess of Wales wearing a red sweater with a pattern like that on it - takes me back a few years. 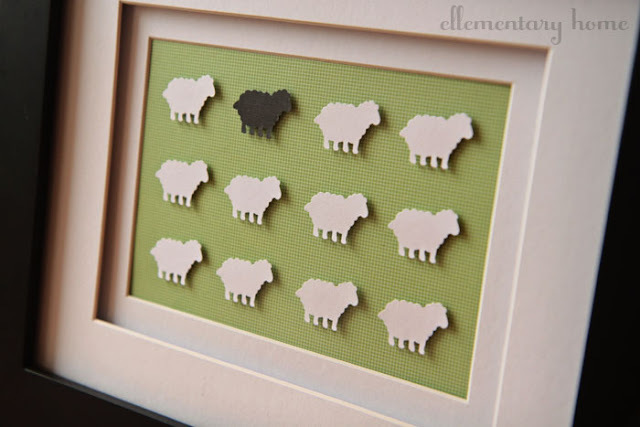 I lol'd at the inclusion of a black sheep, I *love* it! So cute and simple to make...I love those kind of crafts! I also like that you can change it up from season to season...fun! Love it! Simple and Sweet! I hope you will link up to my Hippity Hop Easter Project Hop. Oh my goodness! So cute. Glad to know I'm not the only one addicted to Michaels. I just discovered craft punches last week. And with that being said, I completely understand how one could have a weakness in this area. I loved this when I first saw it and I love it now! That black sheep is me!! Love this so much - I have tons of scrapbook supplies from back in the day when I did it by hand (what was I thinking)! So glad you joined our Cinch party! Following! This is so great! The black sheep gives it such great personality. I love this so much I pinned it. 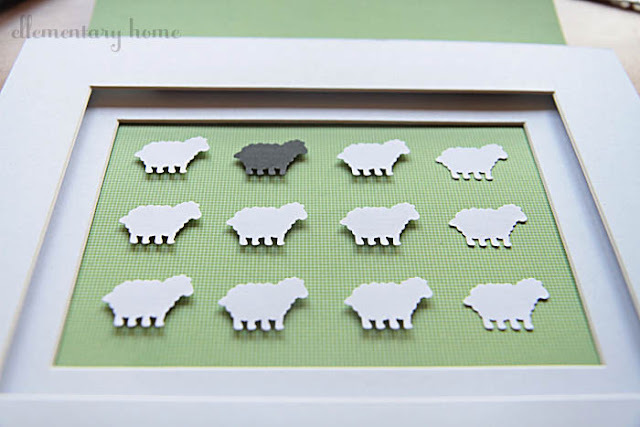 The one black sheep is perfect. Thanks so much for linking up to our party. Such a cute idea for inexpensive artwork! I could also see this in a nursery! love it. M.